‘Final Girls’ is Riley Sager’s debut novel. I first became aware of ‘Final Girls’ when I spotted it on social media, it was everywhere and with Stephen King singing the book’s praises, I was curious to see if the book was worthy of all its hype. The story is primarily seen through the narrative of Quincy Carpenter. A happy go lucky baker in a settled relationship but with a very dark and troubled past. Many years ago, when she was at university, Quincy was the last survivor of a massacre when all her friends were killed. Quincy then became known as one of the Final Girls. Her and two other girls were the sole survivors in massacres, but then one of the girls apparently kills herself and the other one turns up at the Quincy’s house, forcing Quincy to face up to the life and the past that she had hidden very deeply. The story is written in two tenses, past and present as both Quincy faces up to the ghosts that changed her life dramatically and the present time, where for the second time in her life, she has become the focus of the American press. As she tries to move forward with her life, there are constant reminders particularly when Sam, the other Final Girl wants to know very single detail of that fateful night, so much so that Quincy begins to doubt her memories of the nights’ events. Around her, Quincy has a strong network of support from her boyfriend Jeff and Cooper, the policeman who rescued her that night and has become one of her closest friends during the tough times. I spent an afternoon reading this book and was unable to put it down. Quincy is a great character, for everything that she has been through, she’s remarkably strong and quick-witted, but as the story progresses and she delves deeper into her memories, things are different and this makes her doubt the pattern of events. Fast paced and with the inclusion of the past events, which sets the scene and atmosphere of the story tremendously. ‘Final Girls’ is a dark and gruesome tale. A cleverly written psychological thriller which is riddled with suspense from the first page, this book is a must read. 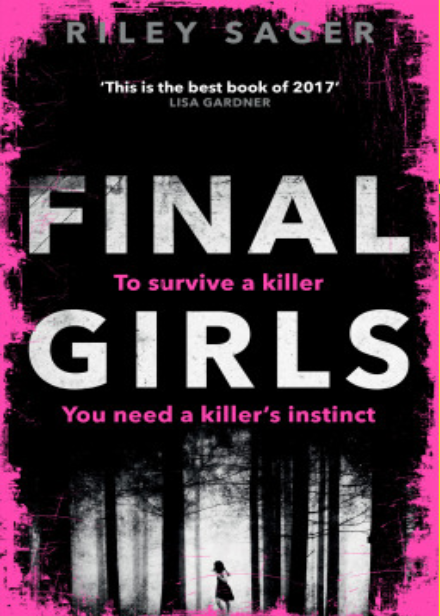 You can buy Final Girls from Amazon and is available to buy from good bookshops.